Have you ever considered running your own OpenSim region? Well I did! After years of building and scripting in SL and on the OpenSim grid at virtyou GmbH, I wanted to experience this installing and running an OpenSimulator server myself. I must say, it looked easy to do..... One of the members of the Dutch Edusim group (Johan Taal) wrote a great DIY on this at eduwiki.opensim.nl, which is in Dutch. I used one of my old computers and deleted Windows, installed Ubuntu on it. That all went smoothly, even the fixed IP address was easy (I thought). Then I downloaded the latest OpenSim version, compiled it and set it up as a standalone version. It worked. But that is just the start, I wanted to have this sim working on Hypergrid, so more installing had to be done: mysql database system, Robust, ini files had to be worked on, etc. Finally it worked. It spent many hours to have the basic OpenSim grid running, connected to Hypergrid. But none of the additional modules are working yet, no friends list, no groups, etc. But Vivox voice runs fine, after sending a short email they gave me a free account which was very easy to install. Thanks Vivox. OpenSim DIY or not? Well we are still testing, not all steps have been made yet so it is too early to draw any conclusion now, but it looks promising. Sure, I want a stable environment for my schools and it will take much more editing and time before it all works fine on my personal grid, but it is interesting to find out how things work and how OpenSim has to be set up. I still don't know how to backup this, I have no account creating portal, but that will come, patience is the word in this. So if you like programming and fiddling with ini files and modules, you should really try this, it works. Having your own grid is the ultimate form of getting yourself started creatively. Any Dutch users can ask for a free account at edugrid@opensim.nl to have a look around the Edugrid and see what a 3D world offers. You can also let someone else do all this backups, upgrades and problem solving, saving all the hours you spent on installing and tweeking. For only 40 euro's a month (educational pricing) any educator can have his own region running at virtyou. And it's fast, stable and allways there. 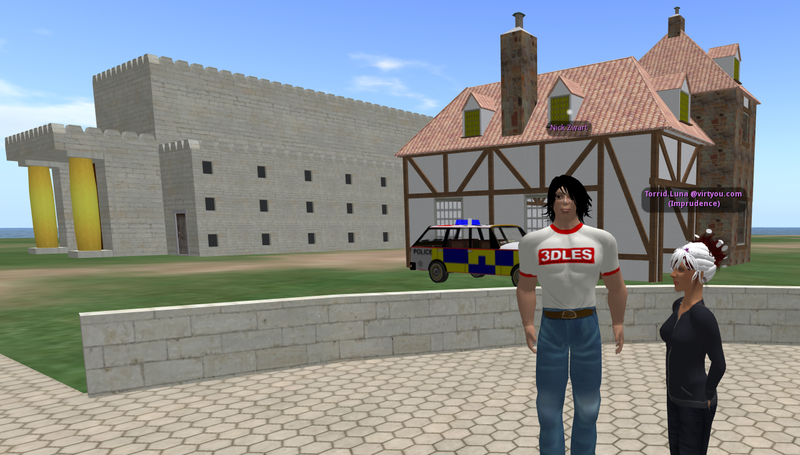 Building and scripting Chatterdale - the first virtual language village on OpenSim - was fun to do and now that several schools in Europe are using it I can see that I made the right choice with this grid. Want to have a look on the virtyou grid? Go to http://virtyou.com/en/ and create an account there. Until now it has been a great experience to install OpenSim for myself (thanks to Edugrid), I am proud that I have a grid running in my own house. It will take some time to tweek all the littile errors out but I will get there. My Linux (Ubuntu) machine is running fast and I can build on my own land. That's Ok for now, but I do want more.